Nowadays, there are so many different video and audio formats that to play them we need to have more than one multimedia player. Total Video Player is capable of playing the majority of video formats that currently exist, as well as the most used audio formats. Thanks to the latter, we can use a single application to play the immense majority of our videos, and we'll be able to forget about hunting for codecs over the Internet. The list of video formats that Total Video Convert supports is immense: MPEG4, H264/AVC, 3GP, WMV, ASF, SAMSUNG L55W DC, CASIO, KODAK DC V550, iPod MPEG4, iPod H264, iPhone MPEG4, iPhone H264, Apple TV MPEG4, Apple TV H264, DivX AVI, H264 AV, MJPEG AVI, SWF Video, FLV video, Gif Animation, NTSC/PAL DVD, NTSC/PAL SVCD, NTSC/PAL VCD, Apple QuickTime, HD MPEG TS and MPEG1. And the following audio formats: WAV, CD, MPEG audio, Ms WAV, Ms WMA, OGG, AMR audio, AWB audio, AC3, SUN AU format, m4a, AAC, MMF and FLAC. 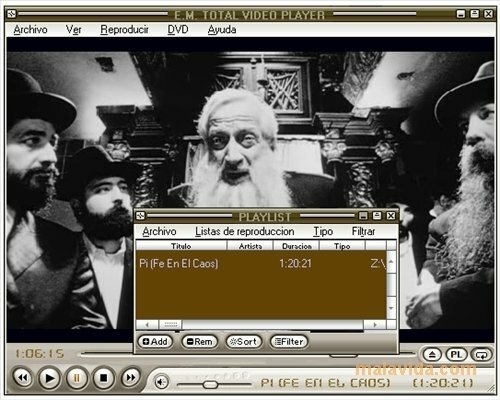 It has a rather modern interface for a multimedia player, a playlist and the possibility to read subtitles. An ideal alternative for those people that go through many films and LPs.